This post is the third in a series examining how city development impacts the poor. If you haven't read the first & second posts, start there as it will help make sense of what follows. Graphic artist Archie Archambault of Portland, Oregon has made a series of neighborhood-oriented maps for his hometown as well as Boston, San Francisco, and many other cities. It's a great way to get a feel for a city based on how people congregate into communities. He has not yet made a map of Tampa, so I mimicked his style to make the map shown here. It integrates a few of the areas conceptualized by Invision Tampa as well as other neighborhoods throughout the area. Numbers from the US census Bureau (adjusted to current dollar values) shows the median income changes in each area over a 22 year period from 1990 to 2012 demonstrating our past trajectory which helps in anticipating where we are going as a city. What I found is fascinating and may help inform current news such as The Nehemiah Project in Sulphur Springs. Historic Ybor for example has seen a 130% increase in median income over that period of time as it rose from $13,000 in 1990 (adjusted to current dollar amount by census) to $30,000 in 2012. Downtown residents have seen a 143% increase in median income, VM Ybor increased 20%, while Ybor Heights — just to the north — only inched 5% upward over the 22 year period. Seminole Heights increased by 33%, and College Hill shot up by 109%. In fact, every community on this map that is inside (or rather, east and south of) the Hillsborough River saw a rise in their median income. Either those who lived in these communities have done extremely well for themselves, or the demographics of those communities have been in flux over a period of time. College Hill is an obvious example of a demographic transition taking place, as the public housing projects were demolished and replaced by a mixed income model which is now known as Belmont Heights. While many struggling families receive assistance to live in that community, many who lived there before have been displaced to areas like Sulphur Springs and Suitcase City. Now the numbers for the communities on the other side of the river are quite different. Those old, early Tampa suburbs like Sulphur Springs, Egypt Lake, and Lowry Park Central have seen substantial decline in median incomes within their areas over the same period of time. While Egypt Lake dropped 22%, Lowry Park decreased by 28%, and Sulphur Springs saw a 31% drop — and as of 2012 had a median income of $20,000. These trends have continued, and today Sulphur Springs is a notoriously distressed neighborhood with all of the struggles and crime that have always accompanied poor neighborhoods. This is what the effects of gentrification are; just like the city spread in ripples like the pond's surface, so too the poor are now being displaced in the same way. Beach & Pool at Sulphur Springs historic postcard. 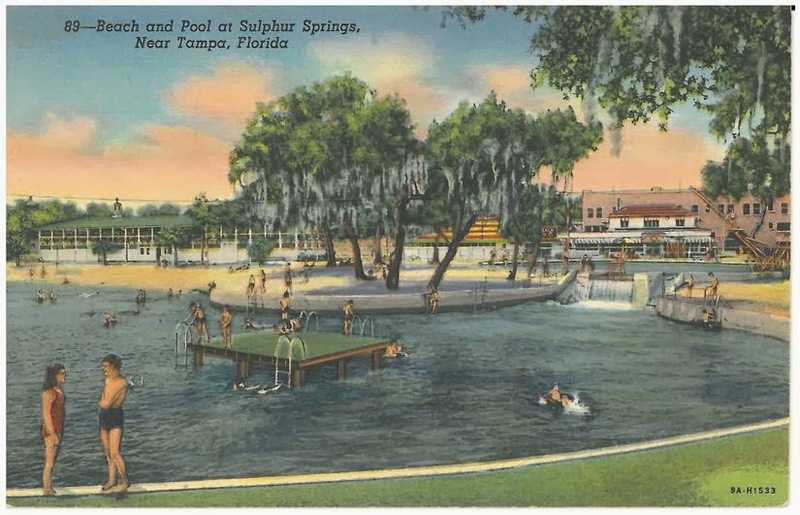 "What the postcards do not show is that Sulphur Springs, like all of Florida, was as a strictly segregated community, with most African-Americans living in the area known as Spring Hill. While white residents swam in the pool, African-Americans had to use other spots on the river for recreation, swimming, fishing, and baptisms. Many African-Americans traveled by bus to work as maids or golf caddies in Temple Terrace, a river community where the idyllic river postcards reflect a largely white reality." Tampa is not as strictly segregated as it once was though it does retain a strong legacy as a community loosely segregated along some ethnic, though mostly economic lines. Sulphur Springs is today a poor community with a population that is just over 6,000 people, and 47% of that population is below the poverty line, 36% are experiencing food insecurity and 19% of the current residents are unemployed according to Feeding America studies mapped by The Tampa Bay Network To End Hunger. Ethnically, the community is 16% white and about 82% Black and Hispanic according to city-data.com. The student demographics for Sulphur Springs Elementary School even further reveal the Demographic make up of the community. It is not going too far out on a branch to hypothesize that those white children represented on this chart are also from families experiencing poverty. This is the economic segregation that is typical throughout Tampa today and it is the postcards above that we all remember when we hear Buckhorn say that we are going to "return Sulphur Springs to what we know it could be." Given the history of such moves throughout the country and Tampa's own legacy of displacing poor minorities (i.e. Malfunction Junction on top of Central Ave, I-4 through Ybor Neighborhood, & Encore condos being erected where central housing projects once stood just to name a few), one can fairly easily anticipate the Demographic Inversion about to take place in the Springs over the next few years. Tampa City Council recently named the Hillsborough River the new center of the city of Tampa. Good thing all the properties on the other side of the river are affordable now. If you are interested in keeping up with the general discussion the city is having there will be an Invision Tampa meeting tonight at 6pm about the West river area and North Boulevard Apartments. If all the numbers, maps, and demographics seemed to loose you, this video might help. enjoy. I am reminded of 2 Samuel 12 and I Kings 21. Please continue to publish this research. This is well done! It points out the system of effective apartheid in Tampa. How can the so much of the Christian community remain so silent?